Need a few more books to add your reading list? Good because I’ve got a few recommendations! I started getting into YA books about 5 years ago. I never gave them much thought after leaving my teen years and figured they were just books for young people to enjoy. They aren’t! Anyone at ANY age can read YA books. I was surprised by how much I actually enjoyed reading this genre. I ended up reading a ton of YA books, including many trilogies, and it’s become one of my favourite genre of books to read. You know that feeling when a book ends that you really loved and you feel sad. You actually miss the characters and think about them often? In a trilogy, you can carry on that same feeling longer. Your journey doesn’t end after the first book. It’s only beginning. I guess you could say I have a thing for trilogies. I’ll buy the entire trilogy before reading the first book. What if it turns out to be amazing? I made that mistake with the Twilight books only to discover that Eclipse was no where to be found anywhere in my town. Talk about panic. So now when I see a trilogy that looks interesting, I’ll buy all three books so I can read one right after the other without having to wait. Ready for some book recommendations? 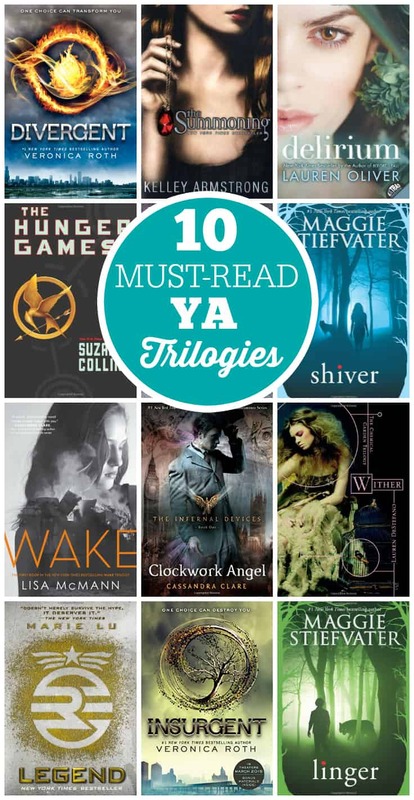 Here’s 1o must-read YA trilogies to start you off! You can also find these books on Amazon.ca and Kobo. Do you read YA? Have you read any of these trilogies? Great list! I’ve read a few of these (Legend series is one of my faves) but I’m always looking for new ones to add to my never-ending “to-read” list. I don’t read a lot of YA, however, have been fortunate to win a book from time to time. I haven’t read any of these series, but have certainly heard about a lot of them. The Abhorsen Trilogy by Garth Nix. Realistic fantasy, strong female characters, and very well written. The individual books are Sabriel, Lirael, and Abhorsen. There is a fourth book that came out recently, Clariel, but it’s not quite as good as the original trilogy.